For other uses, see Pesto (disambiguation). Pesto (Italian: [ˈpesto]; Ligurian: [ˈpestu]) or, in extenso, pesto alla genovese (Italian pronunciation: [ˈpesto alla dʒenoˈveːze; -eːse]), is a sauce originating in Genoa, the capital city of Liguria, Italy. It traditionally consists of crushed garlic, European pine nuts, coarse salt, basil leaves, Parmigiano-Reggiano (Parmesan cheese) and pecorino sardo (cheese made from sheep's milk), all blended with olive oil. The name is the contracted past participle of the Genoese verb pestâ (Italian: pestare), which means to pound, to crush, in reference to the original method of preparation: according to tradition, the ingredients are "crushed" or ground in a marble mortar through a circular motion of a wooden pestle. This same Latin root, through Old French, also gave rise to the English noun pestle. Strictly speaking, pesto is a generic term for anything that is made by pounding; that is why the word is used for several pestos in Italy. Nonetheless, pesto alla genovese ("Genoese pesto") remains the most popular pesto in Italy and the rest of the world. Pesto is thought to have two predecessors in ancient times, going back as far as the Roman age. The ancient Romans used to eat a similar paste called moretum, which was made by crushing garlic, salt, cheese, herbs, olive oil and vinegar together: the use of this paste in the Roman cuisine is even mentioned in the Appendix Vergiliana, an ancient collection of poems where the author dwells on the details about the preparation of moretum. During the Middle Ages, a popular sauce in the Genoan cuisine was agliata, which was basically a mash of garlic and walnuts, as garlic was a staple in the nutrition of Ligurians, especially for the seafarers. Although likely originating from and being domesticated in India, basil took the firmest root in the regions of Liguria, Italy, and Provence, France: it was abundant in this part of Italy, though only when in season; that is why marjoram and parsley are suggested as alternatives when basil is lacking. Ratto mentions Dutch cheese ("formaggio olandese") instead of pecorino sardo since Northern European cheeses were actually common in Genoa at the time, thanks to the centuries-long commercial trades of the maritime republic. This recipe for pesto alla genovese was often revised in the following years (a noted revision by Emanuele Rossi occurred in 1865, only a couple of years after Ratto's Cuciniera), and it shortly became a staple in the Ligurian culinary tradition, with each family often featuring its own pesto recipe (with slight differences to the traditional ingredients). This is the main reason why pesto recipes often differ from each other. In French Provence, the dish evolved into the modern pistou, a combination of basil, parsley, crushed garlic and grated cheese (optional); pine nuts are not included. In 1944, The New York Times mentioned an imported canned pesto paste. In 1946, Sunset magazine published a pesto recipe by Angelo Pellegrini. Pesto did not become popular in North America until the 1980s and 1990s. Pesto is traditionally prepared in a marble mortar with a wooden pestle. First, garlic and pine nuts are placed in the mortar and reduced to a cream, then the washed and dried basil leaves are added with coarse salt and ground to a creamy consistency. Only then is a mix of Parmigiano-Reggiano and Pecorino added. To help incorporate the cheese a little extra-virgin olive oil is added. In a tight jar (or simply in an air-tight plastic container), covered by a layer of extra-virgin olive oil, pesto can last in the refrigerator up to a week, and can be frozen for later use. ... which are ground up with the other ingredients. Pesto is commonly used on pasta, traditionally with mandilli de sæa ("silk handkerchiefs" in the Genoese dialect), trofie or trenette. Potatoes and string beans are also traditionally added to the dish, boiled in the same pot in which the pasta has been cooked. Pasta, mixed with pesto, has become a well-known dish in the majority of countries today, with countless recipes being posted online for "pesto pasta". It is sometimes used in minestrone. Pesto is sometimes served with sliced beef tomatoes and sliced boiled potatoes. Pesto comes in a variety of recipes, some traditional and some modern, as the very noun pesto is a generic term for anything that is made by pounding. Pesto alla genovese, the quintessential pesto recipe, is made with Genovese basil, coarse salt, garlic, Ligurian extra virgin olive oil (Taggiasco), European pine nuts (sometimes toasted) and a grated cheese like Parmigiano Reggiano or Grana Padano and pecorino sardo or pecorino romano. A slightly different version of this sauce exists in Provence, where it is known as pistou. In contrast with pesto alla genovese, pistou is generally made with olive oil, basil and garlic only: while cheese may be added, usually no nuts are included in a traditional pistou because no pine trees grow there to provide the nuts. Pistou is used in the typical soupe au pistou, a hearty vegetable soup with pistou flavour. The sauce did not originally contain basil, however; instead, cheese and olive oil were the main constituents. Sometimes almonds are used instead of pine nuts, and sometimes mint leaves are mixed in with the basil leaves. It has been pointed out that pesto is essentially a combination of flavourful leaves, oily nuts, hard cheese, olive oil, garlic, salt and lemon juice; any ingredients meeting this description can produce a pesto-like condiment. Pesto alla siciliana, sometimes called pesto rosso (red pesto), is a sauce from Sicily similar to pesto alla genovese but with the addition of tomato, almonds instead of pine nuts, and much less basil. Pesto alla calabrese is a sauce from Calabria consisting of (grilled) bell peppers, black pepper and more; these ingredients give it a distinctively spicy taste. Outside Italy, the household name pesto has been used for all sorts of cold sauces or dips, mostly without any of the original ingredients: arugula (instead of or in addition to basil), black olives, lemon peel, coriander, or mushrooms. In more northern countries, ramson leaves are sometimes used instead of basil. In the 19th century, Genovese immigrants to Argentina brought pesto recipes with them. A Peruvian variety, known as "tallarines verdes" (meaning green noodles, from Italian tagliarini), is slightly creamier, lacks pine nuts (because of their rarity and prohibitive cost in Peru), may use spinach and vegetable oil (in place of olive oil), and is sometimes served with roasted potatoes and sirloin steak. Vegan variations of pesto can include mixes of fresh basil, nuts such as walnut or pine nut, olive oil, and the addition of miso paste and nutritional yeast to provide additional flavor enhancement to the dish. For reasons of expense or availability, walnuts, pecans, cashews or even peanuts are sometimes substituted for the traditional pine nuts. Also, while the nuts are traditionally used as is, some recipes call for prior toasting. 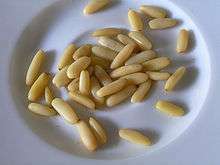 While not preferable, other culinary nuts may be used due to the taste disturbances that some people may experience after consuming pine nuts (see pine mouth). Many online recipes in English for pesto will also list black pepper among the ingredients, which the traditional Genoese recipe omits. 1 2 3 4 5 6 "Pesto Genovese: an Ageless Benchmark of Great Italian Cuisine". Retrieved 11 October 2011. 1 2 Campionato Mondiale Pesto al Mortaio. "Pesto's official recipe". Retrieved 10 August 2011. ↑ "pesto". Online Etymological Dictionary. ↑ Pronzati, Virgilio (2012). "Si fa presto a dire pesto" [It is one thing to say Pesto]. Come uno specialista di enogastronomia racconta la storia popolare Genovese [How a food and wine specialist relates the Genoese folk history] (PDF) (in Italian). Genoa. p. 2. 1 2 "Moretum - Appendix Vergiliana". Retrieved 19 January 2016. ↑ Ratto, Giovanni Battista (1863). La Cuciniera Genovese. Genoa: Fratelli Pagano. ↑ McGee, Harold (2004). On Food and Cooking: The Science and Lore of the Kitchen. New York, New York: Scribner. ISBN 978-0-684-80001-1. LCCN 2004058999. OCLC 56590708. ↑ Rossi, Emanuele (1865). La vera cuciniera Genovese facile ed economica. Genoa. ↑ Traverso, Amy (April 2008). "Pesto's Premiere". Sunset. p. 116. Archived from the original on 13 May 2008. Retrieved 22 July 2008. ↑ Pecorino. "You can used different PDO Pecorino". 1 2 "Consorzio del pesto Genovese recipe". mangiareinliguria.it. Retrieved 21 February 2008. ↑ Rankin, Dottie. Very Pesto. Celestial Arts. p. 8. ISBN 978-1-58761-208-4. 1 2 Brennan, Georgeanna. A Pig in Provence: Good Food and Simple Pleasures in the South of France. Chronicle Books. p. 156. ISBN 978-0-8118-5213-5. ↑ Dale Berning Sawa (1 February 2016). "10 best foods to make from scratch and save money". The Guardian. Retrieved 1 February 2016. ↑ Locatelli, Giorgio (2011). Made in Sicily. HarperCollins. n.p. ISBN 978-0-00-745722-9. ↑ "Recipes: Mushroom Pesto Crostini". Food Network. ↑ "Gewürzmix für Bärlauch Pesto" [Spice blend for ramsons pesto]. Retrieved 19 July 2013. ↑ Tucker, Eric; Westerdahl, John & Weiss, Sascha. Millennium Cookbook: Extraordinary Vegetarian Cuisine.